The PRI, The Generation Foundation and UNEP FI have launched a series of roadmaps as part of the Fiduciary Duty in the 21st Century initiative. The publications are the culmination of extensive consultation with regulators, investors, policy makers and attorneys across the countries. They make a series of recommendations to enable the market-wide adoption of ESG integration. 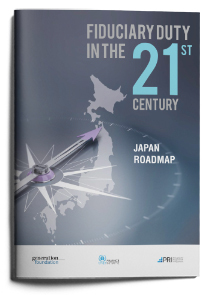 The Japan roadmap makes recommendations to ensure that Japanese institutional investors understand that their fiduciary duties require them to consider material ESG issues in their investment processes and decision-making. The recommendations cover five categories: stewardship and engagement, corporate governance, ESG disclosure for pension schemes, corporate disclosure and the signature role of GPIF in Japan’s investment chain. To download the publication in English click here and in Japanese click here. To learn more about Fiduciary Duty in the 21st Century visit our webpage here.